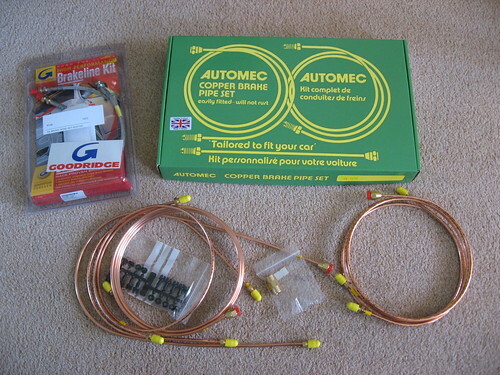 New stuff in the post this week - a full copper brake line set and steel braided brake hoses. The brake lines on the MG are steel which made them a bit harder to remove than if they were copper, but despite this, the front line had split under the chassis, so we needed to replace them. To be honest I was glad of the excuse as the brake lines are one thing I definitely want to make sure are new. The Automec kit comes with all the lines you need for both front and rear brakes, easily labeled for your make and model. The hardest part was removing the old lines, both as they were steel and so pretty inflexible, and because they were thoughtfully bundle-tied with other hoses and cables in the engine bay, meaning you had to be pretty careful with the extraction. Fitting the new lines wasn't as hard as expected, the copper is pretty easy to work, even with your hands and the kit comes with replacement clips to secure the new copper to the walls of the body. The Goodridge hoses finished off the job, neatly joining the lines to the wheels.